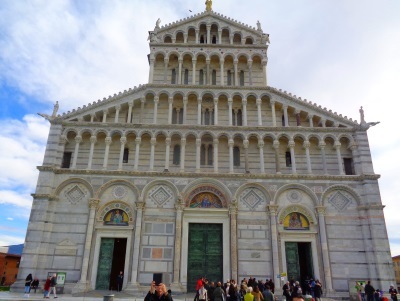 In this article you will find detailed information about the cathedral of Pisa and other buildings on the cathedral square (Piazza dei Miracoli). These are in particular the world famous Leaning Tower, the Baptistery (largest baptistery in the world) and the historical Camposanto cemetery. The article is intended for tourists who want to visit these places of interest in Pisa and also contains information about entrance fees, opening hours and so on. The famous Leaning Tower is the freestanding bell tower of Pisa Cathedral. The church is a few hundred meters north of the old centre of the city. The large cathedral square is a lawn surrounded by walls and houses. You can see everything from the outside for free. The Leaning Tower of Pisa can also be climbed (18 euros, number of visitors is limited, tickets you get on this website). In addition, you should definitely go into the cathedral and the huge baptistery Baptistery (much cheaper). It is one of the most important sights of Italy. Correspondingly much is going on. You can’t just go to the Leaning Tower of Pisa, buy a ticket and go up. Since the crowd is too large, the number of people who can go to the tower is limited. The campanile of the cathedral (bell tower) is 55 meters high. Construction began in 1173. Already after a few meters noticed can be that the tower begins to incline. The clay subsoil on one side gave way much more. The construction was interrupted for a long time, the Leaning Tower was only completed in 1372. It was feared for over a century that the Leaning Tower would eventually collapse. Only a few years ago it was erected again with high technical effort. Now the tower is inclined by about 4 degrees, that is about 4 meters. You can see this very clearly from below. Rarely is the tower of a church more famous than the church itself. In Pisa this is the case. Nevertheless, the huge church itself is also more than worth seeing. You can visit the cathedral for free if you have a ticket for any other sight (Leaning Tower, Baptistery, etc.). It is after the Cathedral of Florence with the famous dome is second most important church in Tuscany. It is the largest baptistery in the world. Baptisteries used to be necessary because unbaptized people were not allowed to enter a church. So the baptism of children took place in a baptistery, after which they could go to church. Entrance fees Leaning Tower, Cathedral of Pisa etc. There are tickets at several ticket offices in different buildings on the church square. These are well signposted and hard to miss. There are tickets for all sights everywhere. The Leaning Tower is really expensive: 18 Euro per person (January 2019). As I said, you can only buy tickets for the Leaning Tower of Pisa with a fixed date and time. As far as we know, tickets are available up to 20 days in advance. On the tower you are not allowed to take bags, backpacks etc. with you, but you can leave your luggage free of charge at a cloakroom. The controls at the tower entrance are like at the airport with metal detectors and so on. There are also other tickets for other sights in Piazza dei Miracoli (Square of Wonders, Cathedral Square). You can buy tickets for the Baptistery, for the old Camposanto cemetery and for a small museum (Sinopie Museum). The larger Cathedral Museum was closed for renovation during our visit in November 2017. One attraction (baptistery, museum or cemetery) costs 5 Euro, two attractions cost 7 Euro and all 3 cost 8 Euro. Due to the small price differences we recommend the ticket for all 3 sights. With each of these tickets, but not without, you can also visit the cathedral. You can see all the sights in any order on one day. The tickets are scanned at the entrance so that they cannot be used twice. During our visit in November, the Pisa Leaning Tower, the Pisa Baptistery, the Simnopie Museum and the Camposino Cemetery were all open daily from 9 am to 6 pm. The cathedral itself was open from 10 am to 6 pm. The opening hours seem to apply to all days of the week. The opening hours of the next days are indicated at the cash desks. If you come to Pisa by train as part of a day trip, you can buy a bus ticket (1.40 euros) at the newspaper shop in the train station. 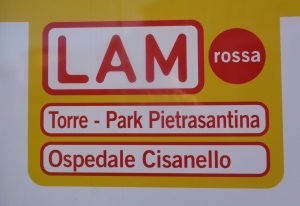 Take the well signposted bus of the red line (Italian: LAM rosso) directly in front of the main station Pisa. They leave every 10 minutes and take about 12 minutes to the Leaning Tower or the Square of Wonders. You can easily find the bus stop in front of the train station, as a large number of tourists go there and the bus stop is well signposted. Always just follow the crowds. In Pisa important bus lines have colors (in this case red) and no numbers. Also the bus stop where you have to get off can hardly be missed, as the driver announces this (mostly he says „Torre“) and most other passengers get off there in the mostly crowded bus lines. The buses of the line „LAM rossa“ are unfortunately often very crowded, more buses are necessary. There are many trains to Pisa, for example from Florence main station. There are also frequent connections from Lucca, La Spezia, Viareggio and so on. Also destinations like Rome, Genoa and Milan can be reached directly from Pisa. By car: There are huge parking lots nearby for the huge number of people who want to go to the Leaning Tower of Pisa. Many tourists come with their own car or with a rental car on a day trip to Pisa. Everything is well signposted. On foot: After visiting the Leaning Tower and the Cathedral, we recommend that you go into the city centre. You can walk across the old town, across the river Arno and through the central pedestrian zone back to the train station in about 30 minutes. From Pisa, you should definitely look at more than just the Leaning Tower, also during a day trip. Pisa is a very beautiful city with many sights. In downtown is between main station and cathedral square on both sides of the river Arno. On the station side of the Arno are the shopping streets, on the cathedral side the old town. The cathedral square (Platz der Wunder, Italian: Piazza dei Miracoli) consists mainly of well-kept lawns that are not accessible. The green grass, the white marble buildings and the often blue sky in Italy are beautiful for the eyes. Even with simple cameras, you can take great photos of the Leaning Tower and the Cathedral of Pisa through the colour contrasts. Fortunately, in Piazza dei Miracoli itself there are no souvenir shops, snack bars and the like. But behind the exits there are many stalls offering fast food, drinks, T-shirts, leather goods and much more. In the back buildings, however, there is an official souvenir shop and a bookstore offering books on the Leaning Tower of Pisa, Cathedral Church and so on. It is essential to follow the instructions of the staff, drinking alcohol in public, entering the green areas, etc. will result in heavy fines. In the back area of the Square of Miracles in Pisa there is a public WC. The toilet costs 80 cents (end of 2018). You can see all the important buildings on the Cathedral Square: the Cathedral of Pisa, the Baptistery and of course the Leaning Tower. The cathedral (name Santa Maria Assunta) is often referred to as the Cathedral of Pisa. In Italian the church is called „Duomo di Pisa“ or more precisely „Il duomo di Santa Maria Assunta“. 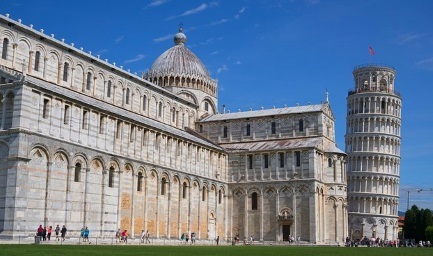 In English, the name „Pisa Cathedral“ is most often heard. The cathedral square is called „Piazza dei Miracoli“ in Italian. This expression is also used in English, but there is also the translation „Square of Miracles“. The Leaning Tower Pisa is called „Torre pendente“ in Italian and „Leaning Tower“ in English. 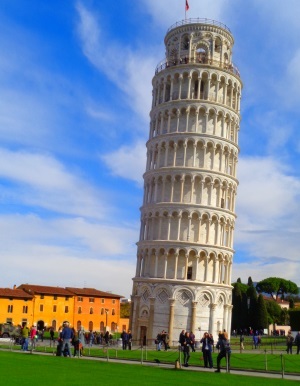 Many Italians in Pisa also simply say „Torre“ (tower). It is the bell tower (Italian: campanile) of the cathedral. The large baptistery of Pisa next to the cathedral is called „Battistero di San Giovanni (Pisa)“ in Italian. San Giovanni is John the Baptist. 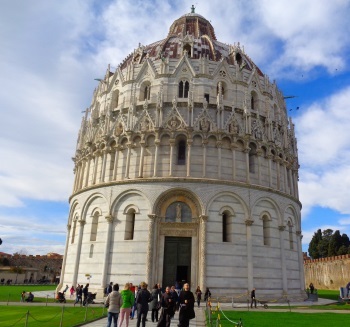 In English you say „Pisa Baptistery“ or „Baptistery of St. John“.